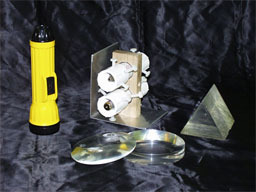 The laser and the flashlight are different colors (red, white). The light from the flashlight spreads out, but the light from the laser stays together, even when it travels a long distance. You can see the laser beams inside the Vortex generator because they light up the fog particles. Light passes through things (i.e. air, window glass) to get to us. When light goes through some things, it changes direction (bends). The way the light is bent depends on the shape of the thing it's moving through. 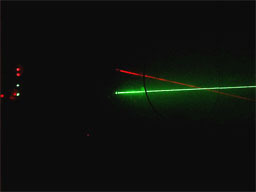 The convex lens () bends the lasers together. The concave lens )( bends the lasers apart. Handle the lenses WITH CARE. They are non-replaceable! Return them to their storage box rather than dumping them in the bin to get scratched up. Also be careful with the lasers, as they are worth more money than ANY other piece of equipment. Try not to shine the lasers at people's faces. All the lasers that the Physics Van uses are less than 3mW and will not damage your eyes if accidentally viewed directly. However, it is still not a good idea, especially because it is important for the kids to see that we take safety seriously. Point the laser and flashlight at a screen or wall and turn them both on. If the vortex is empty, put a SMALL amount of fog into it. Turn on the two mounted lasers and explain what they are. The different colors aren't really important to this part of the demo, they just make it easier to tell the light beams apart. Point them into the side of the vortex generator, and explain that you can see the beams now because the light is hitting the fog particles and lighting them up. Tell them that light passes through things (i.e. air, window glass) to get to us. Explain that when light goes through some things, it bends. Show them the lenses, and explain that their job is to bend light a certain way. 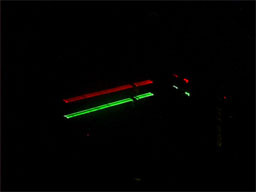 Show the shape of each lens (using hand motions if necessary) and demonstrate the light bending by placing it in front of the lasers. Make sure the lens is near the Vortex generator so the audience can see the lasers crossing or spreading out.